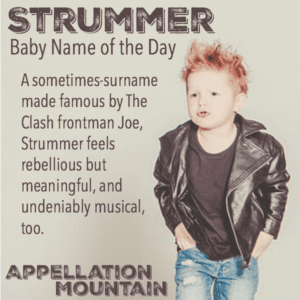 Rock star baby names come with plenty of built-in swagger. They’re modern, stylish, and often surprising. But they’re usually not too cool to wear. After all, we’re used to hearing the names repeated, decade after decade. Plenty of surname names carry a New England prep school vibe. Think Carter or Landon. But rock star baby names often feel rough and tumble, creative, fierce. You could borrow a first name from a legendary musician, of course. Elvis and Ziggy feel distinctive. 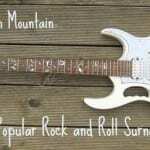 But many of the most beloved rock icons come with buttoned-down first names. David and John, George, Michael, and Joan. A handful of names feel rock and roll, but take their inspirations from band names. Think (Led) Zeppelin, or maybe even (Bon) Jovi, a 2018 inductee. Others technically qualify for this list, but they read like first names, not surnames. So I’ve left off (Nina) Simone and (Peter) Gabriel, too. To keep this list manageable, I’m sticking strictly to inductees into the Rock and Roll Hall of Fame. There’s no shortage of possibilities well beyond this list, and, of course, Rock Hall adds more performers annually. The most recent group includes Inductees from the Class of 2018, as honored on April 18, 2018. 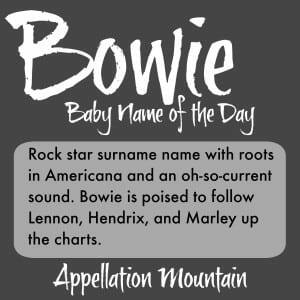 David Bowie’s 2016 death prompted more parents to consider this name, though it remains outside the US Top 1000 – for now. The name fits perfectly with the many Bo- and Beau names finding favor today. As for the artist? Widely considered among the most innovative performers of recent history, his career spanned five decades of constant re-invention. If you’re after a name that signals creativity, there’s something about Bowie that works. Of course, nineteenth century pioneer Jim Bowie – for whom the Bowie knife is named – lends this one an Americana vibe, too. Read more about Bowie here. Cash is king, but Johnny Cash was more rebel than ruler. We tend to think of The Man in Black as a country music legend, but he had plenty of crossover appeal, and was inducted into the Rock and Roll Hall of Fame, too. His surname spiked in popularity following the 2005 biopic, Walk the Line, starring Joaquin Phoenix in the title role. Plenty of longer names, from ancient Cassius to saintly Cassian, could easily shorten to Cash. But for now, the straightforward surname is most popular of them all. Incidentally, it is the singer-songwriter’s birth name; he even traced his roots back to Fife, in Scotland, where there is still a lake that shares the name. I’ve yet to write about Cash. Check back and I’ll update when I do. Kurt Cobain and Nirvana redefined music in the 1990s, introducing the world to grunge and becoming mega-superstars seemingly overnight. And then, just as suddenly, Cobain tragically took his own life. Depending on your age, this might feel every bit as significant as other names on this list, like Strummer or Lennon. It’s generally assumed to be Irish, though the name’s exact roots are elusive. It sounds like an on-trend choice today, even though it’s seldom heard. I’ve yet to write about Cobain, but check back and I’ll update when I do. I’ve yet to write about Costello, but check back and I’ll update when I do. Some might think ice hockey when they hear Crosby, thanks to Pittsburgh Penguins captain Sidney Crosby. 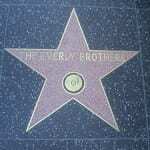 But it feels very musical, thanks to two influences: crooner Bing Crosby, and Rock and Roll Hall of Famer David Crosby. The latter is twice-inducted into Rock Hall, as a member of The Byrds, as well as Crosby, Stills & Nash. That lends the name an impeccable rock ‘n’ roll pedigree, and yet it’s not the most obvious of choices on this list. Read more about Crosby here. Dylan has long since transitioned from rock ‘n’ roll honor name to mainstream favorite. And yet it still brings to mind living legend Bob Dylan. The singer-songwriter’s stage name may have been inspired by the Welsh poet Dylan Thomas, another frequent association. And then there’s Beverly Hills, 90210, and 90s heartthrob Dylan McKay, played by Luke Perry. And it’s been a Top 100 choice since 1990. But despite widespread popularity and lots of notable Dylans, Bob remains such a powerful association that this one still feels like a rock and roll – and a poetic – pick. Don and Phil Everly recorded a series of memorable songs in the 1950s and 60s, like “Wake Up Little Susie” and “All I Have to Do is Dream.” It was virtually unknown as a given name until the twenty-first century. Anthony Kiedis used it for a son in 2007, but it has never cracked the Top 1000 for boys. 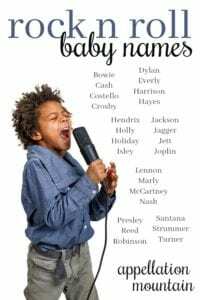 In 2012, it first charted for girls, thanks to our love of Evie names, and that three-syllable, ends-in-y sound that has defined feminine favorites from Dorothy to Emily to Avery. Channing Tatum and Jenna Dewan welcomed daughter Everly in 2013, and the name has skyrocketed, currently sitting just outside the US Top 100. It feels a little bit rock and roll, and whole lot stylish. 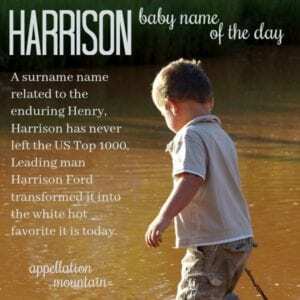 As a Beatles surname, Harrison carries a rock and roll pedigree and a more buttoned-down vibe than, say, Jagger or Hendrix. It’s easy to picture a small Harrison wearing a bow tie, wielding a Stratocaster – or maybe both. George Harrison, of course, was the quietest member of the Beatles, just 15 when he joined John Lennon and Paul McCartney in the band that would eventually become the world-changing group. He’s also inducted separately, for his long solo career. Besides fitting in with the musical names on this list, Harrison also belongs with longer surnames for boys, like Sullivan, that wear so well. Read more about Harrison here. I’ve called Hayes a preppy hellraiser name, but songwriter-actor-rapper-deejay Isaac Hayes lends it a whole other dimension. He’s best known for his soundtrack to 1971’s Shaft, for which he won a Grammy and an Oscar. But that was just one part of his long and storied career, which included writing credits for classics like “Soul Man” and “Hold On, I’m Comin’.” This casts Hayes in a different light, making it feel smooth, sophisticated, and cool, all in a very rock and roll kind of way. Read more about Hayes here. Hendrix comes from the evergreen Henry, a surname name originally Dutch. But while Henry feels classic and conventional, Hendrix is the amped-up, rock and roll version of the name. It brings all the charisma of world-changing guitarist Jimi Hendrix, whose brief but brilliant career produced unforgettable songs. Factor in the added appeal of the letter X. It’s edgier than Harrison, but not quite as bold as Jaxon. Hendrix could make music, but he could still be an accountant, too. That makes this name flexible and rock and roll, a winning combination for a son born today. Maybe Holly signals winter and Christmastime more than rock and roll, but the immortal Buddy Holly argues that it belongs on this list, too. A decade later, the British Invasion brought The Hollies to fame, including Graham Nash. And then there’s Billie Holiday, the jazz singer inducted as an early influence on modern music. The Isley Brothers scored a string of hits from the 1950s into the 80s. From “Shout” to “It’s Your Thing,” they recorded many a memorable song. Sound-wise, their surname fells like a mix of Isla and Riley, which makes it rich with potential. It sounds just like German surname Eisele, which may mean iron. Lady Antebellum lead singer Hillary Scott gave the name Eisele Kay to her firstborn, after a family surname. I’ve yet to write about Isley. Check back and I’ll update when I do. Jackson brings to mind many things, but it makes this list thanks to the King of Pop, Michael Jackson. The stories of his troubled and tragic later days tend to cloud our memory of the singer. That suggests parents appreciate Jackson’s other associations, rather than the name’s musical ties. But given the success of Michael, and the rest of his talented family, it earns a place on this list, too. Read more about Jackson here. We love boys’ names starting with J, and oh, that -er ending is a favorite, too. But it’s Mick Jagger, frontman of the unstoppable Rolling Stones for five decades and counting, that lends this name so much appeal. Jagger rhymes with swagger, and this name has plenty of it. The surname originally referred to a peddler, but these days, it’s pure rock and roll. I’ve yet to write about Jagger, but check back and I’ll update when I do. In the 1980s, Joan Jett scored a string of hits with her band, the Blackhearts. Born Joan Larkin, she was a founding member of the Runaways, and then launched her solo career with a cover of “I Love Rock and Roll.” She’s called the Godmother of Punk and the Queen of Rock and Roll, so her name belongs on this list. And yet, I’m not sure if Jett’s place on the boys’ list owes anything to her legacy. The name started to catch on for boys in the 1990s, long after Jett’s heyday. Read more about Jett here. Janis Joplin burned bright, her brief career producing many unforgettable songs in just a few short years. But despite her widespread fame, Joplin is pretty rare as a given name. As a surname, it relates to the Biblical name Job. Besides Janis, there’s also the composer Scott Joplin, known as the King of Ragtime. I’ve yet to write about Joplin, but check back and I’ll update when I do. Of all the rock star baby names, Lennon might be the most instantly associated with a celebrity: the late, legendary John Lennon. Popular for boys and girls alike, the name brings to mind all the energy of the Beatles, but the hope of Lennon’s “Imagine” even more. It comes from a Gaelic name, and it might mean little love – yet another reason parents continue to embrace this musical choice. I’ve yet to write about Lennon, but check back and I’ll update when I do. Marley brings to mind both reggae icon Bob Marley and his son, the equally talented Ziggy. It wears well for a boy, fitting right in with surname choices like Mason and Brady. For girls, it joins a long list of ends-with-ley names, like Paisley and Kinsley. That means re-spellings abound, with both Marlee and Marleigh also appearing in the US Top 1000. I’ve yet to write about Marley, but check back and I’ll update when I do. I’ve never added McCartney to a rock star baby names list before, but why not? Mc- and Mac- names continue to fare well for our children, and McCartney feels like a logical successor to long-time girls’ favorite Mackenzie. I’ve yet to write about McCartney, but check back and I’ll update when I do. Nash owes its popularity to a Don Johnson television series. (No, not Miami Vice. The other one!) But while Nash Bridges has faded into pop culture history, Graham Nash makes this a rock star-ready choice. The musician is twice-inducted into the Rock and Roll Hall of Fame, once with The Hollies, once as a member of Crosby, Stills & Nash. 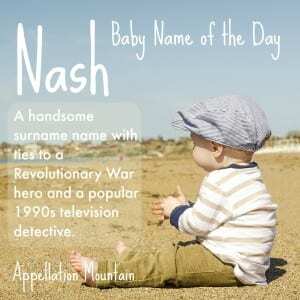 Despite Graham’s roots in the UK, Nash feels like a cowboy name – western, brash, cool. And at least a little bit rock star. Read more about Nash here. The King of Rock’s surname is used almost exclusively for girls – more than twelve times as many girls as boys received the name in 2016. Maybe that’s because we like Preston so much for boys, or maybe it’s because so many girls’ names end with the -lee sound. Either way, Presley makes for an interesting pick for a child’s name. It could be a sister for Everly – or Penelope. And don’t count it entirely out for boys, either. After all, Elvis is one of the most recognizable icons on this list. I’ve yet to write about Presley. Check back and I’ll update when I do. The spelling Reid ranks higher on the US popularity list, but it’s Reed that feels rock star. That’s thanks to singer-songwriter Lou Reed – born Lewis Allen Reed, founding member of the Velvet Underground, followed by a long solo career. Of course, it’s also a musical term in its own right – the mouthpieces of clarinets and other woodwinds rely on a thin strip of cane called a reed. That makes this name a little bit buttoned-up, but still ready to walk on the wild side. Read more about Reid here. Singer-songwriter turned record exec Smokey Robinson put this surname name in Rock Hall. From frontman of Motown’s The Miracles to National Medal of Arts winner, he’s quite the celebrated artist. And yet, as surnames go, it’s relatively underused. That makes Robinson a choice rich with potential, whether you’re honoring a Robert, or just looking for something in the Harrison family that’s slightly less common. I’ve yet to write about Robinson. Check back and I’ll update when I do. Santana boasts a fascinating history. As a surname, it’s a mash-up of Santa Ana, a common place name honoring Saint Anne, mother of Mary, in Spanish and Portuguese. Carlos Santana, born in Mexico, fused Latin jazz and rock to invent an entirely new sound. The guitarist fronted a band bearing his surname from the 1960s through today. The name briefly caught on for girls in the 1980s, but faded. Glee gave the name to bad girl Santana Lopez, which piqued interest in the name again. But today, a Santana is more than twice as likely to be a boy, inspired by the legendary musician. I’ve yet to write about Santana, but check back and I’ll update when I do. Joe Strummer fronted The Clash, making him one of the founding fathers of 1970s punk rock. Born John Graham Mellor, the musician adopted the musical stage name because it refers to strumming a guitar. That makes it doubly musical – one gentle, one raging. While this name is rare, it’s not unknown. Dropkick Murphys frontman Al Barr has a son by the name, and in late 2017, actor Julia Stiles gave the name to her son. Read more about Strummer here. Like many an ends-in-r name, Turner charts in the US Top 1000 for boys, quite a few spots below Hunter and Carter, but there, just the same. Today’s parents probably think first of Orlando Bloom’s swashbuckling Will Turn in the Pirates of the Caribbean franchise, but Turner is all over the rock world, too. There’s the Queen of Rock and Roll, Tina Turner, inducted alongside ex-husband Ike. Big Joe Turner recorded the unforgettable “Shake, Rattle and Roll” all the way back in 1954. I’ve yet to write about Turner, but check back and I’ll update when I do. 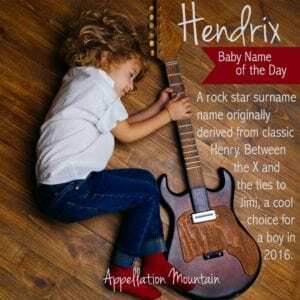 Are there any rock star baby names you would consider? Originally published on February 15, 2013, this post was revised extensively and re-posted on April 9, 2018. Popularity data was updated on July 10, 2018.
i have 3 boys – Hendrix, Jovi, and Lennon! The list is missing Ozzy! I don’t have feelings either way about Ozzy Osbourne, we just love the zippy/cool vibe the name gives us. One of my close girlfriends has a four-ish year old *niece* named Elvis. It’s still surprising every time I hear it. I know of a teenage girl named Tesla. She goes by Tes. We’re using Ramona as a middle for one of our coming twin daughters, at my husband’s suggestion, in homage to the Ramones and the fact that they got their name from the pseudonym Paul McCartney used to give at hotels during the Beatles heyday: Paul Ramone. So it’s a name with a hidden rock ‘n roll meaning. LOVE, love, love it! And what a daring middle choice. I prefer first names, like Billie (Holiday) or Ella (Fitzgerald). My all time favorite singer is Tori Amos, I guess Amos is a legit possibility for a boy (not for our son though). Which got me thinking that while many wouldn’t hesitate to name their girl after a man (Marley, Presley, Everly), I suppose some would find naming a boy after a woman (Amos) not ‘masculine’ enough. I know of a Lennon locally. He must be 5 now. He is named after John Lennon. I’m surprised to see that it’s rising for girls too. I have a girlfriend with a little girl named Boey. Not after the rock star, but darling on her nonetheless. My mom loves Harrison. Pretty indicative of our styles in general and the whole hippie Boomer vs. her uptight Gen X spawn, when I shot that down as a suggestion, and said I preferred the more classic Henry, she wrinkled her nose, said “that’s so old.” and suggested Hendrix instead. Jett or Benatar would be interesting in the theme for girls, though neither is really me. I’m too buttoned-up, I guess. I like the sound of Bowie, but I just don’t love the rockstar naming. I’ve always been a fan of Ramona Quimby, though, and her best friend is a boy named Howie. Similar sound, short for a very respectable Howard! Morrison, Daltrey, Palmer, Ramone, Bryne, Franklin, Jett, Carlisle, Hynde. My favourite band since highschool has been Good Charlotte. Madden (as in Benji and Joel) would make a nice name for a girl, as would Charlotte itself. I would never name a child after a rock star no matter how influential his or her music had been in my life – it’s not like rock stars are naming their kids after their fans. 😉 I think using the first name isn’t so bad as long as it’s not very unusual (like Elvis), but the last name, nah. However, I think some of these names are pretty wearable – Marley, Dylan etc. I’m surprised I haven’t encountered more names inspired by the grunge era, since many people who grew up at that time would have had kids by now. No little Cobains, Corgans or Vedders? I saw a little boy in this week’s birth notices called Vedder Wolfgang, and I also saw at least one Vedder in the Bonds Baby Search last year. I think that one’s here already. I have seen a Halen or two (kinds of seems like a masculine form of Hayley), and a couple of Bowies. Vedder! Whoa. I’ve seen it, too, but it always takes me by surprise. Bowie, on the other hand, I just plain like. Zeppelin makes me want to add Graf. I’ve seen Cobain in a BA and I know a Nirvana who is around 10… so there around just not popular. For more 90’s rockers how about: Thurston, Ulrich, Robinson, Beck. And with a Lilith Fair vibe: Vega, Colvin, Deal, Jewel. I know a little Ziggy. He’s named for Stardust, not Marley. Friend named her daughter Pressleigh. She loved the name Presley, but didn’t want people thinking she was an Elvis fan. To me, they sound the same. Names on this list would be on my “I don’t want anyone to know” list. 😉 I like Lennon and Presley, but would never use them. Possibly not even in fiction.